Paradise on Lake Texoma! 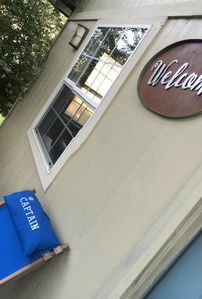 The Captain's Quarters offers a rustic retreat for sea faring folk and land lovers alike. You will not feel cramped in the two story great room graced with soaring ceilings, massive windows, and rich wooden surfaces fashioned from logs indigenous to North Texas by a true craftsman. Sprawling entertaining spaces flow out to the outdoor living area and in-counter gas grill adjoining a large, inviting swimming pool with lights and water features nicely landscaped with tropical plants and flowers. Play a game of poolside billiards under the lanai while you watch the kids enjoying the log playhouse, trampoline, or wooden tree swing. The outdoor restroom is so convenient, too. The master bedroom upstairs has its own private balcony to enjoy your morning coffee and the symphony of birds chirping, or a nightcap under a blanket of stars. 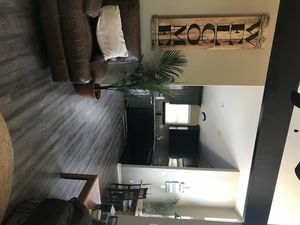 The Property Log Home with a sloping copper roof built in 1999 2368 sf living area 3 bdrm 2.5 bath Max occupancy 12 Bedrooms Bedroom 2 and 3 are located downstairs. One is equipped with a king sized sleep number bed, the other has a queen. The great room has ample room for airbeds or sleeping bags in addition to the small sleeping quarters outside the master upstairs, and there is plenty of room outside to pitch a few tents if you need to. We can also accommodate very large groups when necessary with The Cottage, VRBO #1324181. Ask us about booking both properties together. Baths 2 full baths 1 outdoor 1/2 bath General Information Check-in 4:00 PM Check-out 11:00 AM Linens provided Towels provided Tanning bed provided Kitchen stocked with pantry items, utensils, cookware, dishes, flatware, stove, refrigerator, coffee maker, microwave, oven, dishwasher and toaster. Lots of counter space and a bar to visit while you prepare your favorite meals. Indoor Dining Large, rustic table for 6 Counter space for 4 Outdoor Dining One table for 6 2 tables for 4 Sofas and chairs for a crowd Outdoor 2 large gathering areas with ample seating and a nice place to relax or mingle Large, lighted swimming pool with water features Playhouse Trampoline Tree Swing Covered wrap around deck Lanai Outdoor fire pit Circle drive Additional parking available Room for Tents Private balcony with spiral staircase Additional details Kitchen – stocked with everything you need to prepare ingredients you bring. Large screen televisions Outdoor in counter gas grill West facing covered deck adjoining the pool area. Outdoor fire pit Vaulted ceilings, wood burning fireplace, and wall to wall windows in great room. Master Bedroom King bed Tiled shower Vaulted ceilings Private balcony overlooking the pool Spiral staircase private entry Tanning bed Leisure Activities Relaxing on the deck Watch a Regatta in April Walking Bird watching Shopping Theatre Sight seeing Museums Wildlife photography Sports Activities Hiking Biking Sailing Power boating Jet skiing Paddle boarding Kayaking Swimming Golfing Horseback riding Location When you are ready, the area is full of opportunity for adventure! Sail aboard the Compass Rose for a once in a lifetime experience of what life was like aboard a Brigantine in the 1860’s. Weekend At Dock tours 1st Saturdays 10:30-1:30 from Grandpappy Point marina. Enjoy kayaking, hiking, swimming, or search for fossils at Eisenhower State Park. Hagerman Wildlife Refuge is a haven for watching migrating birds and a great spot for wildlife photography, hiking or learning about nature. Full service bar and grill at Poppy’s – Grandpappy point marina. Two venues for full service bar and grill at Highport marina. Enjoy Mexican or Italian fare at local Pottsboro restaurants. Town Center shopping in Sherman, just minutes away. Golf at Denison Country Club or Tanglewood Resort Rent a boat at Eisenhower Yacht Club Shop specialty retail and art galleries in downtown Denison Choctaw Casino offers gaming, bowling, movie theater, spa and dining. Local Services ATM Hospital Groceries Day Spa Churches Playgrounds Policies Smoking allowed outside Pet friendly with fee Early check-in and late check-out when possible for a $100 fee Check-in: 4 pm Check-out: 11 am Family friendly, but not kid proof. Guests are responsible for child safety. Do not move furniture. Do not yell or play loud music. Do not park on street or lawn. No footwear inside main house. Do not tamper with or adjust TV or any wiring. Do not leave doors open. Do not smoke or dip tobacco on ANY hard surface or anywhere inside. No adults over 160 pounds on any kids furniture or bunks. Our goal is to provide an enjoyable experience in a memorable venue you will want to return to again and again. Our policies are guidelines to ensure an easy, pleasurable stay for all our guests. Holiday on Holiday w/Hot Tub!!! In all of our combined travels we have never witnessed a lake view so spectacular! 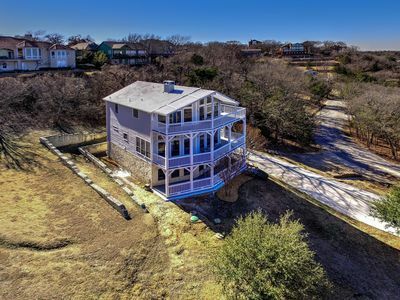 This Malibu styled ocean themed luxury home boasts 3 levels with 3 huge decks all with a breathtaking view of the best part of Lake Texoma which overlooks the islands. You also have a community boat ramp hence no crowds and easy in and outs directly below the estate. The beautiful Russwood community, commonly known as the best neighborhood on the lake, is where this estate resides and is the centerpiece of. The additional lot directly below is also a part of this property. There is plenty of parking for your cars and your boats. Brand new everything in this majestic estate including furniture and comfy bedding. 5 "bedrooms" but 13 total beds. 2 King, 1 Queen, 2 Full, 5 Queen Serta sleeper couches and 3 stacked bunks in this awesome retreat. There are 4 standard private bedrooms and a fifth room we call a bedroom because it has 4 queen sleeper sofas with serta mattress'. Please note the descriptions and numerous photos. Even the driveway is brand new and extra wide to allow for extra parking. Direct TV premium viewing on 3 large flatscreen TV's including the entry level media room with luxury lounge, pool table, ping-pong table and seating for 25 on the entry level alone. Large propane grill with tank included. Up the first flight of stairs you will find the main living room and 2nd massive deck with commanding water views. Also on this level you will find your fully equipped kitchen including all dishes, pots and pans, virtually everything you would expect at home. A Keurig and regular coffee maker are also provided along with a nice assortment of K-cups. All bedding and bath towels are provided. Bring your favorite soaps and hair products. On the top level is the large "Master" bedroom and 3rd massive deck overlooking the lake. Wake up with the morning sun shining down over the water! There is also an additional sofa/sleeper separated by a fireplace in the room. Best coffee seat I've ever had! 2 additional bedrooms on this level with a 2nd bathroom. This vacation property is extremely enjoyable and the memories will last you and your group a lifetime. Warning!!! Leaving is hard. 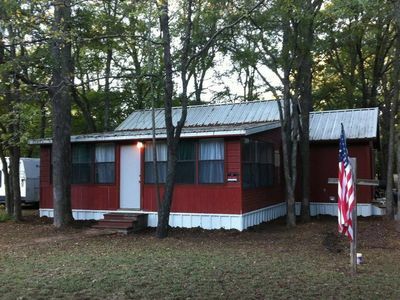 Cute and quaint three bedroom, 2 bathroom lake home/cabin privately owned. Private parking is available. Access to beaches, restaurant and bar within neighborhood. Curtesy dock is available for day boating and jet ski parking. Boat ramp available as well. This is a golf cart friendly neighborhood. This home is walking distance to the water. Island View, Lighthouse Marina, Preston Bend, American Legion, and Elks are all within a one minute drive from our location. Tanglewood Resort and Highport Marina are about a 5-7 minute drive. Grandpappy Marina is a 5 minute boat ride away. This is a great location for fisherman, families and for people just looking for a relaxing weekend getaway. There are kayaks and paddle boards available to rent at the property. Grill, cookware, coffee maker, amongst other amenities are available. 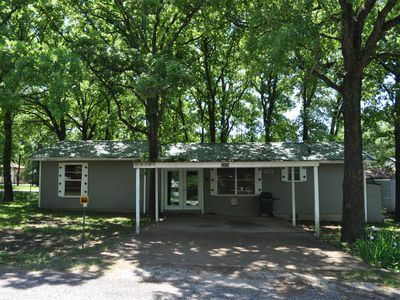 New 2 bedroom 2 bath Lake Texoma home. Great community that you can walk, ride bikes or golf cart down to the lake. This home sits between 3 Marinas, so bring your swim suit, boat, and jet skis. Public access to Island View beach.Entertainment at Highport, Tanglewood, American Legion and the VFW. Home accommodates 6+1 sleeping with 1 king size bed, 2 bunk beds sleeper sofa and 1 twin sleeper chair. Washer, dryer and all the other nice amenities. Come stay and have fun. The Cottage is the perfect setting for creating lasting memories. 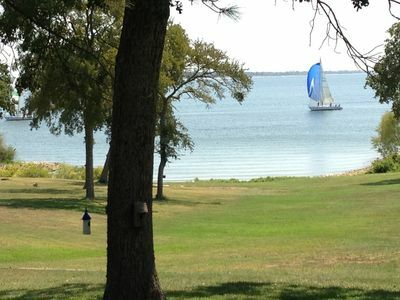 Nestled in trees and nature, overlooking the sailboats at Grandpappy Point marina on Lake Texoma. Enjoy sunsets on the large covered deck with wrap around seating for a crowd or enjoy a relaxing place to have dinner and a movie with the outdoor grill and big screen TV. Six can sleep comfortably in two nicely decorated bedrooms with ample space in the great room for extra airbeds or sleeping bags, and the grounds are large enough to pitch a few tents. The large sectional sofa is so comfortable you won’t want to leave, but there is plenty to do in the area. Your vacation is waiting. We are centrally located – just an hour away from Dallas or 1 ½ hours from Oklahoma City on Lake Texoma. The Cottage Est. 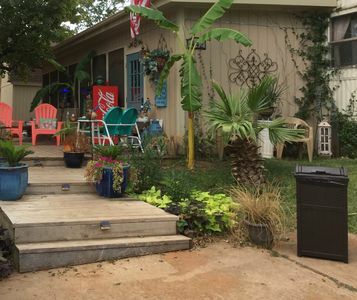 1942 * 1250 sf * 2 Bdrm, 1 Bath Charming retreat to enjoy water sports on Lake Texoma, entertaining a crowd on the large deck and grounds, or simply for the peace, tranquility, and relaxation of the beautiful setting. The Property You will fall in love with this charming lake house as soon as you arrive. Its simple design and comfortable furnishings invite you to rest and relax. Vaulted ceilings, stone fireplace and rustic wood interior mirror the natural beauty of majestic oak and cedar trees cascading down the hill to the marina. Read a good book on the oversized sofa or catch up with family and friends on a huge deck overlooking the marina, build a crackling fire in the outdoor fireplace just off the deck for s’mores and ghost stories or play a game around one of two tables in the large, open great room. Don’t worry about a thing. 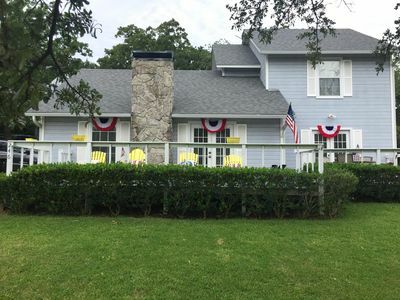 Everything you need is provided, including linens, cookware, a washer and dryer for laundry, indoor and outdoor flat screen TV’s, gas barbecue grill, comfortable beds, stylish furnishings, and plenty of gathering areas for special events or intimate conversation. 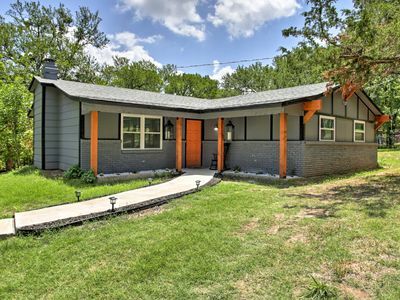 Property Type Updated lake house originally built in 1942 Floor area 1,089 sf 2 bdrm 1 bath Max occupancy 12 Location When you are ready, the area is full of opportunity for adventure! 5 Minutes from large boat ramp at Grandpappy's Marina with complimentary overnight slips. Sail aboard the Compass Rose for a once in a lifetime experience of what life was like aboard a Brigantine in the 1860’s. Weekend At Dock tours 1st Saturdays 10:30-1:30 from Grandpappy Point marina. Enjoy kayaking, hiking, swimming, or search for fossils at Eisenhower State Park. Hagerman Wildlife Refuge is a haven for watching migrating birds and a great spot for wildlife photography, hiking or learning about nature. Things to do: Golf at Denison Country Club or Tanglewood Resort Rent a boat at Eisenhower Yacht Club Shop specialty retail and art galleries in downtown Denison Choctaw Casino offers gaming, bowling, movie theater, spa and dining. Full service bar and grill at Poppy’s – Grandpappy point marina. Two venues for full service bar and grill at Highport marina. 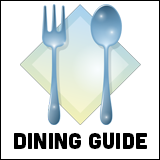 Enjoy Mexican or Italian fare at local Pottsboro restaurants. Town Center shopping in Sherman, just minutes away. General Information Check-in 3:00 PM Check-out 11:00 AM Linens provided Towels provided Kitchen stocked with pantry items, utensils, cookware, dishes, flatware, stove, refrigerator, coffee maker, microwave, oven, and toaster. Dining Cocktail Table for 4 Dining Table for 6 Outdoor Deck table for 6 Cement bench near outdoor fireplace Bed and Bath Bedroom Configuration – Master bedroom 1 – Queen bed Bedroom 2 – 2 bunkbeds (4 single beds) Great room has ample space for sleeping bags or air beds 1 Bathroom – corner shower, sink, toilet Outdoors 2 large gathering areas with ample seating and a nice place to relax Covered deck overlooking Grandpappy Point marina Outdoor fireplace Chimenea Parking Room for Tents Additional Details Kitchen – stocked with everything you need to prepare ingredients you bring. Indoor and outdoor television. Marina view Outdoor gas grill West facing covered deck overlooking the marina with wrap around bench seating and table for 6. Outdoor fireplace Vaulted ceilings, fireplace, and stunning view in great room Leisure Activities Relaxing on the deck Watch a Regatta in April Walking Bird watching Shopping Theatre Sight seeing Food Truck Park Museums Wildlife photography Outdoor Live Music Sports Activities Hiking Biking Sailing Power boating Jet skiing Paddle boarding Kayaking Swimming Golfing Horseback riding Local Services ATM Hospital Groceries Day Spa Churches Playgrounds Cottage Policies Smoking allowed outside Pet friendly with fee Early check-in and late check-out when possible for a $100 fee Check-in: 3 pm Check-out: 11 am Family friendly, but not kid proof. Guests are responsible for child safety. Our goal is to provide an enjoyable experience in a memorable venue you will want to return to again and again. Our policies are guidelines to ensure an easy, pleasurable stay for all our guests. Cozy Fishing Cottage Sleeps 4 - 5. Our cabin is as close to Oklahoma City as any resort on the Oklahoma side of Texoma! Just 2 hours away! 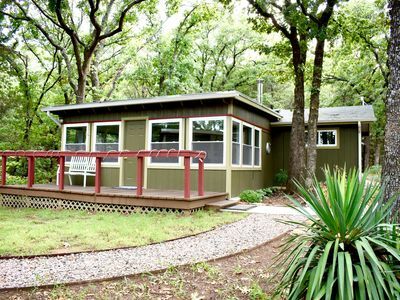 Enjoy great fishing and water sports at Lake Texoma in this nostalgic and comfortable 2-bedroom fishing cabin in the quiet Sherwood Shores Addition. Sleeps 4 - 5. Bedroom 1: queen bed. Bedroom 2: 2 twins. Rollaway bed in utility room. Not wheelchair accessible. LIMIT 1 PET. $50 PET FEE. Take a walk to the beach, or a short drive to marinas, hiking and restaurants. Fully equipped kitchen with dining space for 7. Just bring food! Open concept kitchen/ dining/ living area. Big-screen TV and DVD-player with big selection of family-friendly videos. Over the air TV. ****No cable or wi-fi. **** Washer/ dryer. Plenty of outdoor parking plus 1-car carport. Outdoor grill and spacious shady lawn with outdoor dining furniture. Outdoor fire pit with firewood provided. Boat and canoe rentals available nearby at Cedar Bayou Marina. Kayak rentals from owner subject to availability. Ask us about it! Note: must be 25 years of age to rent. Copy of valid ID and/or signed rental agreement may be required prior to check-in. We have a 2 bdrm cabin with a sunroom, and 1 bath, which sleeps 7-9 people. 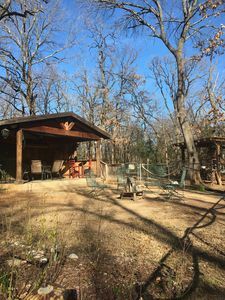 The cabin is walking distance to Lake Texoma, the walk is on a path to the beach, which has been named Rocky Point Estates Beach. It's right across from Grand Pappy's Point. You can walk or drive a dirt bike or a 4 wheeler, down this path. If you are elderly, or handicapped, you may want to drive over to Grand Pappy Point and look at the view, if you do not have a 4 wheeler to ride down to the beach on. Amenities are refrigerator/freezer, stove/oven, microwave, Central AC/heat, washer/dryer, and a dishwasher. The Space There's plenty of room, yet it's a small place and it's what I call very homey and comfortable. Guest Access There is a small convenience store and Tackle Shop on Hwy 84 and Grand Pappy's point is about a 1-2 miles away. Eisenhower Dam is near by, and it's 15-20 min from Choctaw Casino. The best catfish place around is Windy's right across the Eisenhower dam. Interaction with Guests As much as needed. I'm a text message or phone call away The Neighborhood I love the trees and the quiet. The neighbors are great and nice and keep to themselves unless you want to visit. Then, sometimes we all have cookouts together. Getting Around No public transit, but sometimes we catch a free ride on a gator or 4 wheeler to the lake :) Other Things to Note There's a big fire pit outside for bonfires. Our cabin is great for a couple's getaway or enjoyment with family and friends. Stay the night to enjoy the lake as well as some peace and harmony. Renovated and updated with 1 bedroom and 1 bathroom. The bedroom includes a plush queen size bed. 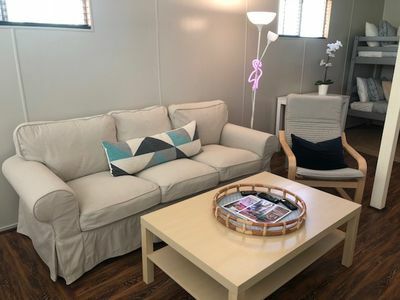 The living area includes 2 bunk beds and all new living room set. The dining table comfortably fits 4-5 with additional seating available at the kitchen countertop. Kitchen is stocked with appliances, cookware, and utensils to create delicious meals for all of your guests. Two tables with ample seating are available on the large covered front patio for outdoor dining and festivities. One Mile to Highport Marina. One and one half miles to Tanglewood Resort and Golf Club, cozy single family home. Fishing, boating, great restaurants. Relax on the deck with comfortable furniture. Keywords: Fully furnished, two private bedrooms. And two bathrooms. One bedroom has king sized bed and separate shower bathroom. Second bedroom has two full size beds. Sleeper sofa in family room. Complete kitchen. Washer, Dryer, dishwasher, stove, oven, micro. All linens. Direct TV, Three TV's, DVD's with each TV. Outdoor charcoal grills ..2. Pricing is for 2 guests. Additional guest cost will be priced on request. La Bella Vita means the Good Life in Italian. The Million Dollar View of Lake Texoma says it all. Escape to this one of a kind Luxury Lake House. 4 bedrooms - 2 up and 2 down, 3 1/2 baths. 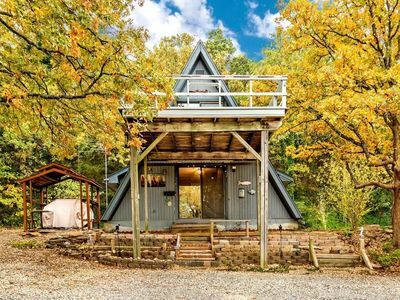 This home sleeps 16 and is the perfect family get away. 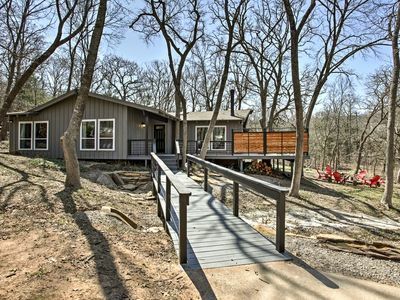 You will enjoy the open floor plan with vaulted ceiling that adjoins the deck overlooking Lake Texoma. Large flat screen TV in Living Room, each Master Suite has its own private bath and flat screen TV. Tommy Bahama Beach themed decor. Large island Kitchen that is fully equipped including all dishes, pots, and pans with all the conveniences you would expect at home. It has a double oven, electric cooktop, microwave, drip coffee maker and Keurig coffee. 2 Interior Dining areas; 2 Exterior Dining Areas. Relax on the two Large decks. Free WIFI and Direct TV. Gas Grill on Patio. Short Drive to High Port Marina or use the Community Boat Ramp. All brand new high quality bedding, pillows, and towels. Bring your favorite soaps and hair products. Bedroom 1 - 1st floor Master Bedroom Suite with King Bed Bedroom 2 - 2nd floor Second Master Bedroom Suite with King bed Bedroom 3 - 1st Floor Sleeps 4 - Full over Full Bunk Bed Bedroom 4 - 2nd Floor - 2 Twin Bunks with Trundle Bed- sleeps 5 Queen Sized Sleeper Sofa - Sleeps 2 High End Roll Out Cot- Sleeps 1 You will love this home!!! 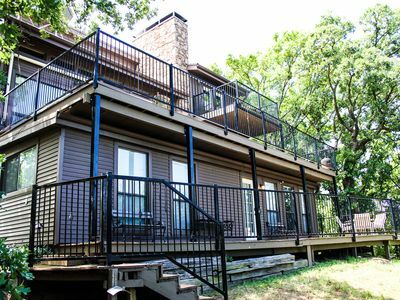 We hope you will enjoy our cozy lake house that features a relaxing balcony, your own boat slip on a boat dock, hiking trails, and swimming with floats. We have provided a few four-wheeler's for transportation to and from the dock and hiking trails. The Kitchen is fully furnished along with a grill. There are plenty of extra blankets and pillows as well. There are three sleeping areas for plenty of guests. Property has first aid kits and fire extinguisher. Bring your boat and have an amazing adventure on beautiful Lake Texoma! 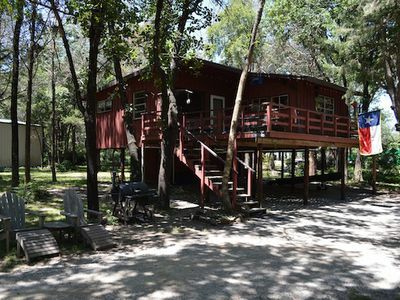 Open and spacious one story cottage nestled in 1/2 acre of trees and multilevel decking. Even a Carport. Fully furnished two bedroom, one bath with oversized shower. Hard surfaced floors, high ceilings in family room. Open and bright. Kitchen is complete with full size smooth top stove and over, refrigerator and bottom freezer. Microwave, coffee pot, blender and so much more. Dishes, silverware, cook wear; all linens provided. Even a stacked washer/dryer unit. Two grills, both charcoal for your bar-b-que pleasure. Outdoor furniture to accomodate your group. 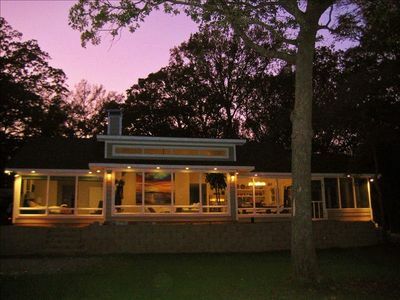 House with Panoramic Views of Lake Texoma! 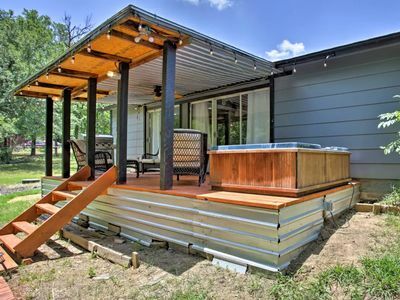 Cozy Texoma Cabin near water! 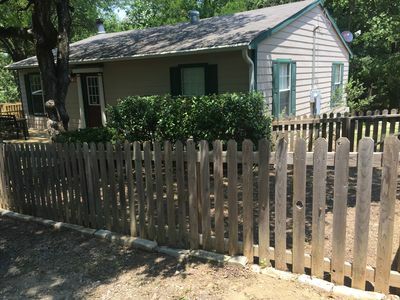 Spacious 2-bedroom home at Texoma sleeps 6-8. Our place is as close to Oklahoma City as any resort on the Oklahoma side of Texoma! Just 2 hours away! Spacious two-bedroom, 1-1/2 bath home in the quiet Sherwood Shores addition. 4 blocks from Sherwood Shores Beach. Full kitchen, 2-car carport, large outdoor fireplace, washer/ dryer. Patio with BBQ grille plus a screened in front porch. Two HDTVs with DVD players and nice selection of family-friendly movies. **** No cable, phone or wi-fi. **** Queen bed, full bed and twin bed, plus full-size sleeper sofa and a twin rollaway. Sleeps 6 or up to 8 for additional fee. Not wheelchair accessible. Shady corner lot with large oak and pine trees. Minutes from Cedar Mills Marina, Cedar Bayou Marina and Juniper Point Recreation Area. Boat ramps, boat slips, pontoon boat rentals (Cedar Bayou Marina), canoe and kayak rentals and fishing guide services all available nearby. For your convenience, up to 4 kayaks are available for rental at this property for very reasonable rates. Inquire as to availability prior to booking! 2 DOG LIMIT. $50 PET FEE PER DOG. Note: must be 25 years of age to rent. Copy of valid ID and/or signed rental agreement are required prior to check-in. Welcome to Casa del Lago- Lake House. Full remodel in fall of 2017. Water front location with walk- up lake access and beautiful view from many rooms. The sunrises are spectacular! Dine on the patio to enjoy the expansive water views or enjoy sitting in the sunroom with a wall of windows with an incredible lake view. This quiet neighborhood is only 1 hour 15 minutes from Dallas. The master bedroom downstairs is nicely appointed with a large bathroom including double vanities and double shower heads. It also includes a comfortable sleeper sofa with memory foam mattress in the sitting area. 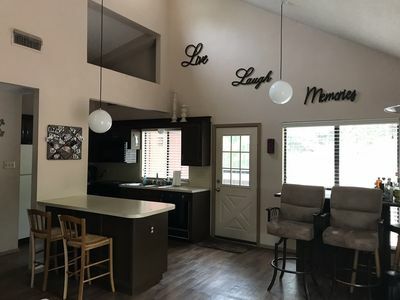 Inside this beautifully remodeled lake house are amenities including games, flat screen TVs with Direct TV, WiFi, fully equipped kitchen with granite countertops , brand new mattresses with bedding, Central A/C, celling fans, and an outdoor gas grill. The other two bedrooms downstairs each have a private full bathroom. The expansive upstairs loft which includes a game room, several beds, and a full bath is an excellent location for all the kids or even several adults! 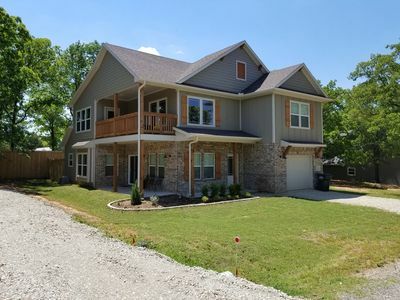 This 4 BR and 4 bath will provide plenty of space for your group! Surrounded by nature and the beautiful lake, all will enjoy the gorgeous sunrises and tranquil setting. All water sports and fishing are just steps away. Marinas are a short drive to rent boats, jet skis, and tubing equipment or launch your own boat. Bonfire pit is an excellent gathering spot at night for the family to make s'mores! Tidy Lake Lodge Sleeps 5. Our cabin is as close to Oklahoma City as any resort on the Oklahoma side of Texoma! Just 2 hours away! 1/2 mile from Sherwood Shores Beach and a few minutes drive to Juniper Point Recreation Area and Cedar Mills Marina. 2 bedrooms each have a queen size bed. Fully equipped kitchen. Large rear deck shaded by large oak trees make for pleasant outdoor dining. Parking for 4 vehicles, including 2-car carport. HDTV with local broadcast channels. DVD player with large selection of classic family-friendly movies. ****No cable, satellite, phone service or WiFi. *** Not wheelchair accessible. We have several kayaks available for rent at very reasonable rates. Inquire at time of booking. Need to rent a bigger boat? Call Cedar Bayou Marina, minutes away. Note: must be 25 years of age to rent. Copy of valid ID and/or signed rental agreement are required prior to check-in. LIMIT 2 PETS. $50 PET FEE PER PET. Your next delightful getaway is just a click away! This spacious house has three bedrooms, two full bathrooms and sleeps 8. Extensive living room includes DirectTV, three couches, ceiling fan and vaulted ceiling with a full-size kitchen. In addition to the great living room space, this adorable house offers two nice sized bedrooms and one oversized master with a private bath. You can enjoy dinner and drinks outside on the great deck space. A carport and circle driveway allows for ample parking. The house is minutes from the community boat ramp, Tanglewood Resort, Highport Marina and area restaurants. If you plan to bring your boat, Lake Texoma offers several unique islands where you can dock and have some fun or enjoy any of the lakeside restaurants. If you like to fish, Lake Texoma offers great striper fishing as well as 8 other species of fish. If you are in the mood to venture out, Choctaw Casino is less than 30 minutes away. You must be at least 25 years old to rent this property. A copy of a valid driver's license will be required at time of booking. 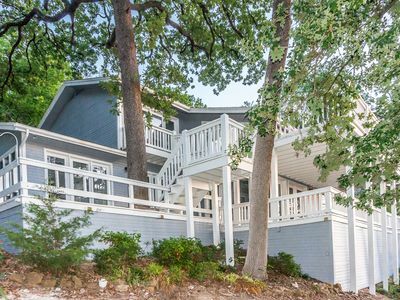 Charming Lake Texoma home with a Cape Cod feel! Large front deck and deck in the back as well. Beautiful wooded lot, with lots of parking! Great for outside activities! Quiet neighborhood yet very close to marina, restaurants, Tanglewood resort, golf, horseback riding, and walking path to a pretty lake cove near the islands. Large open concept first floor with dining table, living area, bar and stools, and large, fully supplied kitchen for great gatherings. Large first floor master bedroom, with king size bed. Upstairs has 2 full bedrooms, 1 full size bed in 1 room and 1 bedroom with 2 twin size beds( house sleeps 6) with twin bed pull outs (house sleeps 8). There is also high speed internet throughout the house 2 flat screen TVs with cable connection. Games to play inside and out. 2 Grills 1-gas & 1 charcoal on back deck Large front deck with table & chairs for eating out. Adirondack chairs to relax and enjoy the Lake Texoma experience! Great atmosphere for relaxing and enjoying your stay! No smoking. No pets. 2 night stay minimum. Please note: Major summer holidays have a 3 night stay minimum. No lake view Check in is 2 p.m. Check out is by 11 a.m.
Just a short walk to the shore of lake Texoma. 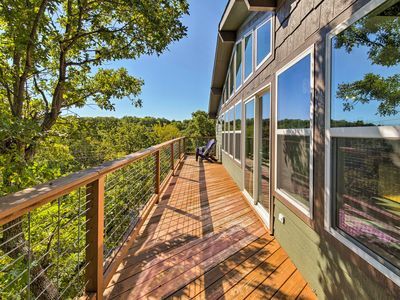 Enjoy sunrise with a cup of coffee on the deck and a view of Lake Texoma all around. This 4 bedroom 2.5 bath, includes one sleeping room in very comfy daybeds with drawer trundles. Large utility with Neptune w/d units, corian counters & sink, 2 in. blinds throughout, 3 zone a/c plus ceiling fans in every room(even in the screened cedar room for the outdoor sleeper). This spacious property is an easy stroll to the lake. It's positioned VERY near water on all sides in a quiet neighborhood at the tip of Preston Peninsula. Sandwiched between the islands on on side of peninsula and Grandpappy marina (visible across the bay) plus Little Mineral Marina, Lighthouse, Highport and various restaurants and parks are close as well! You'll find all the comforts of home with flat panel LED TV's mounted in each bedroom and the living area. There is parking for your boat/trailer, in the driveway. Short term slips are available at Little Mineral Marina, less than 2 miles down the road. This peaceful and comfy home is a great place to decompress or gather your friends and family! The second floor is open and designed for entertaining.You'll find all of the basic necessities in the island kitchen and a propane grill on the trex wrap around upper deck plus a screened porch w/ceiling fan. Huddle up by the fire pit in the back yard and tell your best ghost stories or fishing tales about the one that got away. Plenty of dining space with 2 tables inside for dining and 3 outside. Hutch contains board games & cards(or bring your own favorites). There's plenty of seating, where ever you need it with the stackable chairs and outdoor dining sets. Master Bedroom has a King size bed, 47in wall mounted LED HDTV, full size sofa and recliner with attached sleeping room for 4. Both secondary bedrooms are generous in size and each have queen size beds and wall mouinted LED HD TV's. Kitchen is fully equipped with plenty of lighting, ceiling, under cabinets and natural lighting . Island cook top, GE wall oven, microwave & refrigerator, Bosch dishwasher. There are plenty of custom cabinets in the kitchen and throughout the home. There is also a culligan water system. We offer veterans and a first responders discount. 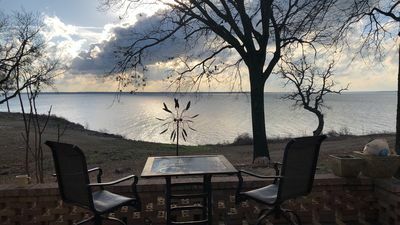 Keywords: sleeps 10, Pottsboro vacation, Lake Texoma, Lake House, Cottage, Vacation Home, Water view, Spacious Lake home, Furnished retreat, Vacation property. My place is minutes from the lake, golf courses, horseback riding and about a 30 minute drive to Choctaw Casino. Grill on the back patio after enjoying a fun filled day at the lake and making S'mores in the fire pit. There is everything needed to cook your own meal or if you prefer, dine out at local restaurants. My place is good for couples looking for a quiet retreat, solo adventures, business travellers and families. Guests will have access to entire home and backyard (minus 2 locked closets for home owners use). House has Wifi, Direct TV, DVD player (DVD library at house or rent from Red Box nearby), and card / board games for the family to wind down the evening with. To do list: * Enjoy Boog's Guide Service to catch dinner * Play a round of golf at Tanglewood Golf Club * Play a variety of outdoor games in the comfort of your own back yard * Grill your 'catch of the day' on the back porch * Enjoy a complimentary bottle of wine with each stay * Make S'mores in the fire pit * Relax inside with some family games and movies to wind down for the evening The neighborhood is very quiet (outside the city limits) with many great residents who have many stories to tell once you meet them! We have an aeronautical engineer, Vietnam Vet and many other great neighbours who are here to wave as you pass by on your way to the lake! A close family friend also has a lake house in the neighborhood that offers a guided fishing excursion. He will help you catch and clean your dinner. Email me for details. Highport Marina is a quick drive that offers lakeside outdoor dining, fabulous drinks and rentals from pontoon boats to jet skis. Choctaw Casino is a 30 min drive into Oklahoma for those who like to roll the dice on vacation. Extreme Sandbox is 10 mins away who lets you play on construction equipment. There is no other place in the world where you can drive a bulldozer and crush a car. Is this on your bucket list? Sleeping arrangements to accommodate 4 include: Queen Size Bed in Bedroom and Trundle Bed in Living Room (Doubles as seating for Living Room). Please note, the house uses a septic tank system; please do not flush anything down toilet except supplied toilet paper. Absolutely NO SMOKING in the house; a nice patio area to throw butts away is provided. No parties; the neighborhood is very peaceful and ask all guests respect the neighbors quiet time at 10:00 pm. Beautifully perched atop a hill in the Tanglewood Hills subdivision rests this large newly remodeled stunner with brand new furniture and something for everyone inside it's expansive walls. With 3 levels and 6 bedrooms proudly boasting all new mattresses and bedding this awesome home wins your heart upon entry with a massive great room and floor to ceiling windows on the North and South walls. Fully equipped kitchen and large dining room plus another 6 seat setup for dining on the adjoining patio. 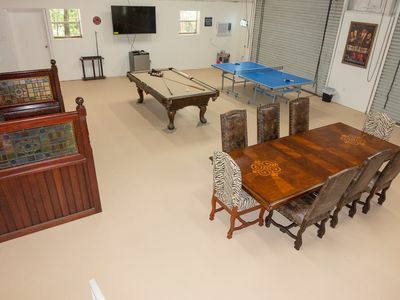 The walkout basement on the bottom floor is a paradise for the young and young at heart with a pool table, ping pong table, 2 bunkbeds in huge lower bedroom. Video game center 2nd living area with yet another large flatscreen and Direct TV. Over one acre with parklike setting right outside where your grill, hammock and so much more awaits. Large beautiful trees on property grounds. 2 car attached and 2 car detached garages. Home gym and so much more await the lucky guests of this magnificent one of a kind property. Less than a mile from Highport Marina and the Tanglewood resort. You will love this location. Master bedroom on main level with full bath and hall bath. Four bedrooms upstairs separated by 2 bathrooms. Bunkbed room in basement also has a full bath. Many birds and wildlife to enjoy and a very short walk down the street to the trail leading to the lake. Kayak, Fish, Ski, Jetski and more with all amenities nearby at Highport Marina. This lake house is one of a kind. There's space for everyone! One of very few houses with direct lake access and sandy beach. The master has a King bed w/cozy day bed & trundle. Bedroom 2 has a Queen bed. Upstairs, Bedroom 3 comes with a King bed, Bedroom 4 has a Queen bed. 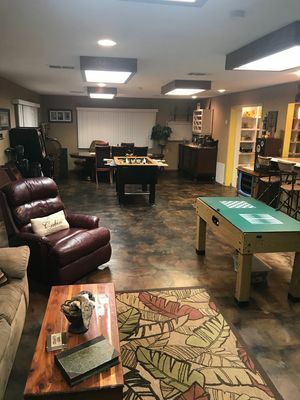 Game room w/pool table, 55" flat screen TV, futon for extra space and lots of family games. Enjoy making smores around the fire pit in the comfort of your own Adirondack chair. The expansive deck, w/sectional & dining table provides a great escape with unbelievable 180 degree lake views. Brand new custom home completed in the Fall of 2017 located in Miller's Cove peninsula on beautiful Lake Texoma! One hour drive from Collin County! Enjoy a quick weekend getaway. Perfect for a family getaway or girls' weekend away! You will have open spaces both inside and out accompanied by great views with this location in Miller's Cove. The kitchen, dining room and family room are open to accommodate large family occasions and gatherings. 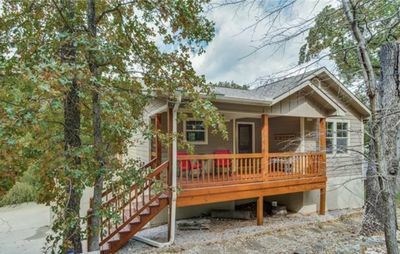 Enjoy the large porch areas and second story balcony over-looking Lake Texoma. This home comes with all new appliances including full size washer and dryer. Each bedroom has new beds and very comfortable new King's Down mattresses! The downstairs master bedroom has its own private bathroom and large walk-in closet. Enjoy sports there is a brand new 65" large screen 4K TV to enjoy the big game! The downstairs sectional makes out into a bed if needed for those large gatherings. Two twin beds are located upstairs for additional sleeping arrangements. There is plenty of parking as well as the house sits on 3 lots. Boat and trailer parking is available. There is a new Fire Pit with propane grill perfect for those evening campfires! Less than 5 minute walk to the beautiful lake beaches. Attention to detail is planned for each visit! We make every effort to insure everything you need is readily available. By booking this property, you agree to the terms and conditions listed. This home is non-smoking. 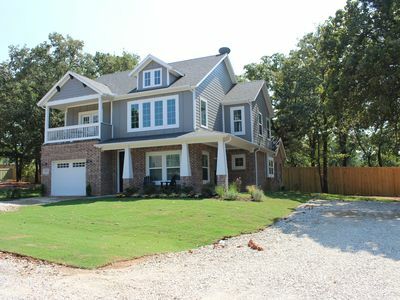 Brand new luxury home completed in fall of 2017 in the Miller's Cove peninsula on Lake Texoma! Come experience some rest and relaxation in our beautiful new vacation home! Soaring family room ceilings with 3-story windows and glass sliding door accessing the wrap around covered porch. Open kitchen and dinning room for large family gatherings. Full size appliances and custom exotic granite counter-tops. Industrial stainless kitchen faucet and farm apron sink! Knotty bead-board custom ceiling treatment in kitchen Vaulted master bedroom ceilings with custom ceiling treatment. Master bath features double vanities and dual shower heads with over-sized walk in shower. Spacious master closet so suitcases are never in the way of your vacation! This home also offers an over-sized utility room with full size washer and dryer. Downstairs you will find a full bathroom with bathtub/shower combination and ship-lap decor accenting the vessel sink! Upstairs stretch your legs in the large open loft with access to the front balcony! 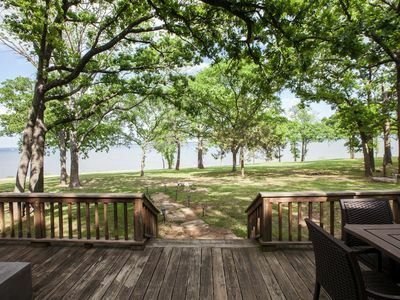 Enjoy your morning coffee while sitting on the front balcony over-looking the peninsula at beautiful Lake Texoma. 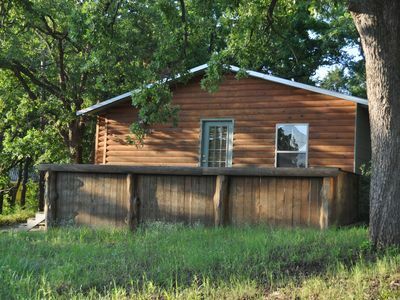 A luxury cabin on a major highway two minutes from beautiful Lake Texoma! Treasure Island is located just 2 minutes away from the Texas & Oklahoma bridge that crosses the beautiful waters of Lake Texoma. It is equipped with a game room, 2.5 Bathrooms, living room, laundry room, & RV/ Boat parking. It also has a fully loaded gourmet kitchen with two stoves, two ovens, and two microwaves. Our gourmet kitchen comes with a chef island to prepare all of your meals. Treasure Island sleeps up 12 people. Additional guests over 12 will be charged a fee of $20/each per day to cover cleaning costs paid upon arrival. Treasure Island also has a bar for you to stock your favorite beverages. Last but not least, it has a conference room setup for your business needs. Contact us for more info. ?Beach Front ?? Water Front #1 ? ENJOY THE GREAT OUTDOORS and JOIN US AT THE LAKE FOR FAMILY FUN AND RELAXATION, LOTS OF FUN FISHING, CANOEING, BON FIRE, GAME ROOM BUNK ROOM FUN FUN FUN!! Texoma Time VRBO 2 - 129 Greenway bend Pottsboro Texas. each house Sleeps 16 Come in,kick off your shoes and just Reeeeeeeeelax! 2650 square feet 3 stories of Views and nature Right on the Water of a 5 acre pond with amazing Views of the Marina. Comfortably appointed living room that will seat 12 comfortably. All New Kitchen with New granite counter tops and stainless appliances. Enjoy your meals on a Large Oak 7- 9 foot Dinner Table. 2nd floor is the Huge 17' x 24' master bedroom with a massive pillow top king size bed and sitting room with a full picture window 10'x17' wall of windows exposing incredible views of the water and Marina. Within 1 mile of the marina and short drive to Restaurants, spa, 80' tower, boat launch and parking. Have fun fishing off the semi-private dock. A little piece of heaven in the back Yard!. Fun for a weekend getaway or a full family vacation. The living room has its own Massive deck for an awesome evening sunset. Full kitchen with all cooking utensils, dining table to seat 12 as well as three bar stools at kitchen counter top. WE HAVE AN AMAZING GREAT ROOM CENTRAL AC and HEAT, 5 FLAT SCREEN TVs, 4 BEDROOMS SLEEPS 16 ADULTS, 4 BATHROOMS, 2 TUBS and 3 SHOWERS, 4 TOILETS. FULL KITCHEN DINING ROOM, On the Water for YOUR VACATION of a LIFETIME!! Enjoy the 3 sun soaked deck, perfect for sunbathing or sipping iced tea and watching the wild life. Additional features include 5 flat screen TV's 1 in every Bedroom, completely updated kitchen and an inviting open floor plan with views of the Water from the kitchen, dining and living area and 3 of the 4 bed rooms. If you want a family friendly vacation or a romantic getaway, you will love this home! NO PETS, HOWEVER WE WILL CONSIDER SMALL BREED KENNEL TRAINED DOGS UNDER SPECIAL CIRCUMSTANCES Air Conditioning Central A/C Bedroom 1 Sleeps 8 - 2 Pillow Top Bunk Beds & 4 in Pillow Top queen beds 2-4 on a pull out couch beds Bedroom 2 Sleeps 2 - New Pillow Top King Bedroom 3 Sleeps 2 - New Pillow Top King Bedroom 4 Sleeps 2 - New Pillow Top King 1st floor Deck 12' x 24' straight to the Water 2nd floor Deck 8' x 8' Marina Texoma View 3rd floor Deck 12' x 24' Marina Texoma View Dishwasher Grill/BBQ Laundry Washer & Dryer Outdoor Misc. Table with Chairs 4 Parking Spaces 3 Stories DISH TV View Full Water View Thank you for looking at our home. FAMILY REUNIONS - WE HAVE 3 HOMES RIGHT BESIDE EACH OTHER IN THIS SECRET HIDEAWAY Texoma Time Lake Houses 127, 129 & 131 Greenway bend Pottsborro Texas. each house Sleeps 15 in beds. We have 3 Lake houses beside each other for rent. 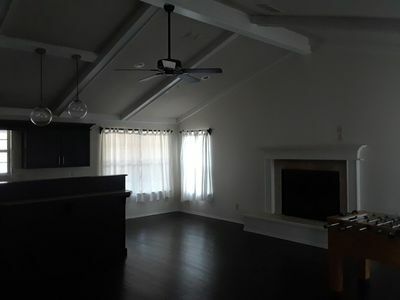 https://www.vrbo.com/784323 https://www.vrbo.com/1040215 https://www.vrbo.com/1187193 each home sleeps 15 and has over 2650 sf 127 Greenway Bend http://www.vrbo.com/784323 Weekend Rate $1050 Friday 4 pm - Sunday 11 am features a Marina theme in the bunk Room with that theme carrying that Nautical theme throughout the home. It is the Dark Blue House. 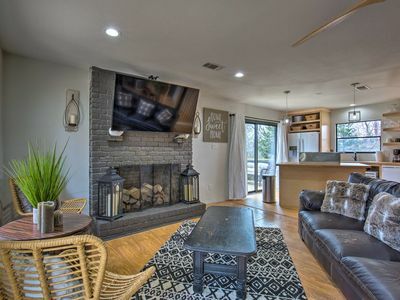 129 Greenway Bend https://www.vrbo.com/1040215 Weekend Rate $1050 Friday 4 pm - Sunday 11 am Features a treehouse theme in the bunk room carrying a Tree theme throughout the rest of the home. It is the Light Gray House. 131 greenway Bend Weekend Rate $1050 Friday 4 pm - Sunday 11 am Features a Canoe and Paddles Nautical theme through out the rest of the home with a turn of the 20th century Canoe hung on the wall. It is the Dark Gray House. LAKE TEXOMA. Water-Pond front / Marina view / Golf / Fishing "TEXOMA TIME" vacation rental in the resort. Vacation rental Town Homes. Sleeps 16 Adults, 4 bedroom, 3- 4 bathrooms. These houses are theme decorated. Wanna get away but you have no time. Here’s your solution. This a real Texas treasure that is affordable, filled with luxury and you will find yourself happy with this Texas Road trip. Would you like to get away, but don’t have time or the extra money to afford an escapade? Do you have a need to enjoy friends, family and the outdoors? If kayaking, fishing, swimming, hiking, boating, canoeing, paddle boating, exploring, shopping and the thought of not having to waste time traveling somewhere, sounds ideal to you, then you need to explore Pottsboro, Texas. Relaxation awaits. Fred and Kim Murfin have created your own secret get away in Pottsboro at Enjoy your holidays here too. Kim decorates the homes for the seasons especially Christmas time is a cant miss. The 4th of July is amazing also with 12 different marinas fireworks display going on over Texoma our homes have a great vantage that will move you in a special patriotic way. Your own private get away is an hour away. Cook outs and fishing at its best! Enjoy your family friendly retreat. Pottosboro is home to an incredible group of rental townhomes that offer more than a place to simply sleep. These townhomes will comfortably fit a party of 16 each. In search of that perfect place to have your next employee’s training session? Were you wanting a short getaway with your best friend and their family? Whatever, your desire, you need to check this place out! Texoma Time is located approximately and hour north from the DFW area. 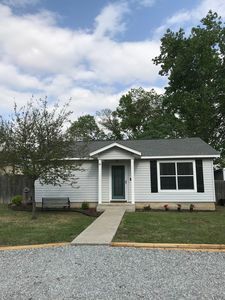 In addition to relaxing in the ideal rental, you will have the opportunity to shop, dine or take advantage of the local events in Downtown Denison. Hi Port Marina is right around the corner 2 miles away. The home is nestled in Tangled Resort located on greenway bend. Right around the corner from The Tangle wood Resort golf course. Lots of great dining at The Island bar and grill, MOs hamburgers, Arroyos Mexican Food and craft pies a personal favorite where you choose your fresh topping and watch them make your 12” pizza for only $8.95 a must have experience. Napoli’s Italian voted Texoma best is only 5 minutes away in Pottsboro. Denison has shopping, dining so much to do and see. Brookshires Grocery is minutes away and carries all the supplies needed for your amazing vacay-stay Lake Eisenhower State Park, explore these “not caves” If an outdoor exploration is your cup of Texas Tea, visit Eisenhower State Park. This state park sits high atop on the lake’s cliffs. This offers you the enjoyment of site seeing to the fullest. When you make a visit to this park, make it a point to find the amazing “not caves”. As shown in this photo, the formation in the rocks, do appear to be cave openings. What looks like the entrance to caverns, is water that has eroded the limestone and created the intrusions. Both Eisenhower park and Downtown Denison are only 8 miles from where you will be staying. To make reservations, or if you have questions, below we provided contact information. 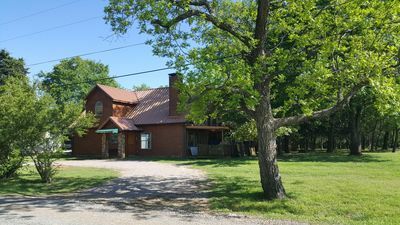 Fred & Kim Murfin Texoma Time Lake house LLC Right on the water of a semi private 5 acre pond. Texoma Lake House 4 bedroom VRBO 131 Greenway bend Pottsboro Tx 75076 water front - family fun ?? WEEKEND ONLY $1050 Friday 4pm - Sunday 10am / 2 NIGHT MINIMUM / AVAILABLE 365 DAYS A YEAR / The good dates are booking now for 2019. so call Fred and Kim at 580 221 4326 and say " Texoma Time, please!! Come in, kick off your shoes and just Reeeeeeeeelax! 2850 square feet 3 stories of Views and nature Right on the Water of a 5-acre pond with amazing Views of the Marina. Comfortably appointed living room that will seat 8-10 comfortably. All New Kitchen with New Corian counter tops & stainless appliances. Enjoy your meals on a Large Polanski Pine 7 foot Dinner Table. 2nd floor is the Huge 17' x 24' master bedroom with a massive Paula Dean style pillow top king size bed and sitting room with a full wall of windows 9'x20' wall of windows exposing incredible views of the water and Marina. Within 1 mile of the marina and a short drive to Restaurants, spa, 80' tower, boat launch and parking. Have fun fishing off the semi-private dock. A little piece of heaven in the back Yard!. Fun for a weekend getaway or a full family vacation. The living room has its own set decks in either side for an awesome evening sunset. Full kitchen with all cooking utensils, dining table to seat 10 as well as two bar stools at kitchen counter top. WE HAVE AN AMAZING GREAT ROOM CENTRAL AC and HEAT, 5 FLAT SCREEN TVs, GAME ROOM 4 BEDROOMS INCLUDING THE BUNKS IN THE GAME ROOM SLEEPS 16 ADULTS, 3 BATHROOMS, 4 TOILETS, 1 TUB and 2 SHOWERS, FULL KITCHEN DINING ROOM, On the Water for YOUR VACATION of a LIFETIME!! SORRY, NO PETS ALLOWED - Air Conditioning Central A/C Bedroom 1 Sleeps 4- New Pillow Top King - sleeper sectional sleeps 2 or more. Bedroom 2 Sleeps 2 - New Pillow Top King Bedroom 3 Sleeps 2 - New Pillow Top King Bedroom 4 sleeps 5- 4 New Pillow Top twin beds and a fifth pull out ottoman memory foam sleeper Living room Sleeps 4 - New Memory foam sleeper sofa and 2 on a full sleeper love seat. Reading Nook 2-Sleeps 2 on two pillow top twin beds with an Amazing view of the 5 acre pond/lake 1st floor Deck 12' x 24' straight to the Water 2nd floor Deck 8' x 8' Marina Texoma View 3rd floor Deck 16' x 24' Marina Texoma View 4th Deck is off of the west side of the living room a hidden knock to enjoy looking at nature. 5th deck Burn pit seats 4 in Adirondack chairs with room for much more available seating. 6th Deck/Dock seats 4 in Adirondack chairs to egg swings with much more available seating. A very nice spot to catch crappie or perch. Dishwasher Grill BBQ Laundry Washer & Dryer Outdoor canoe and paddle boat. Misc. Table with Chairs 4 Parking Spaces 3 Stories Direct TV View Full Water View It's TEXOMA TIME to have FUN!! Call us to book your TEXOMA TIME AWAY TO REEEEELAX!! ++++++++++++++++++++++++++++++++++++++++++++++++++++++++++++++++++++++++++++++++++++++++++++++++++++++++ FAMILY REUNIONS - WE HAVE 3 HOMES RIGHT BESIDE EACH OTHER IN THIS SECRET HIDEAWAY Texoma Time Lake Houses 127, 129 & 131 Greenway bend Pottsborro Texas. each house Sleeps 15 in beds. We have 3 Lake houses beside each other for rent. 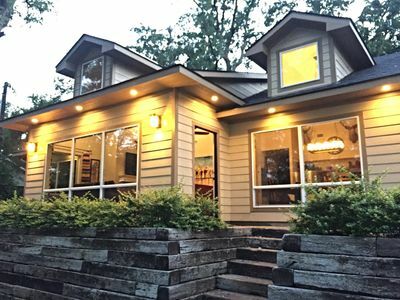 https://www.vrbo.com/784323 https://www.vrbo.com/1040215 https://www.vrbo.com/1187193 each home sleeps 15 and has over 2650 sf 127 Greenway Bend http://www.vrbo.com/784323 Weekend Rate $1050 Friday 4 pm - Sunday 10 am features a Marina theme in the bunk Room with that theme carrying that Nautical theme throughout the home. It is the Dark Blue House. 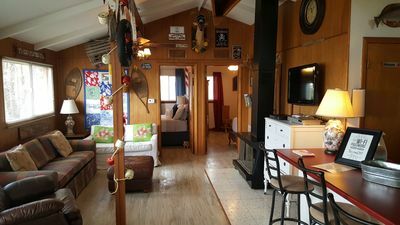 129 Greenway Bend https://www.vrbo.com/1040215 Weekend Rate $1050 Friday 4 pm - Sunday 10 am Features a treehouse theme in the bunk room carrying a Tree theme throughout the rest of the home. It is the Light Gray House. 131 greenway Bend Weekend Rate $1050 Friday 4 pm - Sunday 10 am Features a Canoe and Paddles Nautical theme through out the rest of the home with a turn of the 20th century Canoe hung on the wall. It is the Dark Gray House. LAKE TEXOMA. 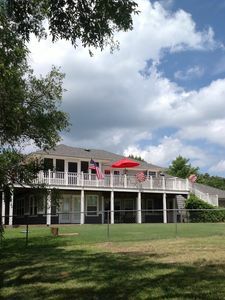 Water-Pond front / Marina view / Golf / Fishing "TEXOMA TIME" vacation rental in the resort. Vacation rental Town Homes. Sleeps 15 Adults, 4 bedroom, 4 bathrooms. These houses are theme decorated. Welcome to The Getaway! Be it one person - a couple - family - etc you will be able to truly 'getaway' from the hustle & bustle of every day life. What you choose to do on your getaway is up to you! 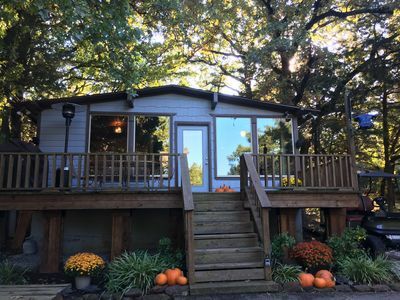 This cozy lake cottage is nestled on the back of a .49acre wooded lot that provides great shade and a peekaboo view of the lake in the winter! The cabin has new hardwood flooring, great central heat/air, full kitchen, board games, gas grill, fire pit, tree hammocks, etc. Enjoy the large living area which is surrounded by windows on three sides, and has great views of the property. The spacious front patio is only steps away from grilling, relaxing in tree hammocks, hanging out by the fire pit, etc! There are two storage buildings on the property, one of which is being converted into a bunk house. The second is used as a small laundry room (large front load washer/dryer). Plenty of room to setup a tent or camper on the property (extension cord for power supply). The neighborhood has its own community boat launch with boat dock, and small beach area (great for kids and adults! ), which is a short 10 minute walk from the property (or couple minute drive) and free to use. We have one kayak (fishing style) that is available for use upon request & availability. The getaway does not currently offer internet/wifi, but cell phone reception is great. We have even used a hot-spot on one phone to connect multiple devices with no issue. There is a TV that has a DVD player built-in, which is not setup for day to day use but available to bring out for watching movies. There is one large bedroom that has a queen bed, but there is room for cots & air mattresses in the surrounding space. You can also easily use an air mattress or two in the living room. We prefer smaller groups at the property, but next to us is a double rental if you are looking for additional rentals in the area to combine for a larger group! Not to mention a few other listings within walking distance of our location. Near by Attractions... - Eisenhower State Park, (15min drive) - Hagerman Nat'l Wildlife Refuge (15min drive) - Lake Tours, Sunset Dinner Cruises, Sandbar Islands, Golfing, Great Fishing, water toys, trails, not far from shopping & amenities! 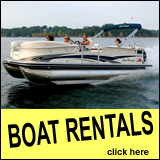 Rent recreational toys... - Rental boats, kayaks, guided fishing tours, lake tours, sunset dinner cruise, jet skis, etc. at near by marinas! Small towns... Just over an hour from the DFW area, about 20mins from Choctaw Casino, 15mins to Dennison/Sherman areas. *Pricing can vary based on season, duration, and number of guests (please contact with questions). We support our veterans with a 10% discount. **Not a party house! ***No Pets, will consider service animals. --Calendar availability is kept up to date, but include any questions or considerations to help better accommodate you. 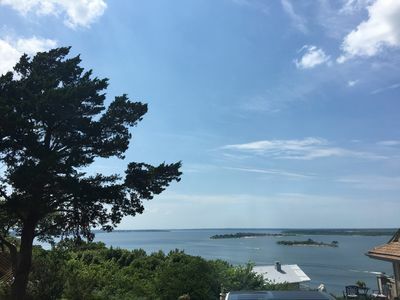 Texoma Time VRBO 1 of 3 homes is an Amazing space just 500 yards from the Golf Club and just a 1/2 mile from the marina and boat ramps with amazing views of Lake Texoma and Hi Port Marina. "TEXOMA TIME" vacation rental. Sleeps 16 Adults, 4 bedroom, 3 bathrooms. Only small breed kennel trained pets will be considered to be allowed. The good dates are booking now Come in, kick off your shoes and just Reeeeeeeeelax! 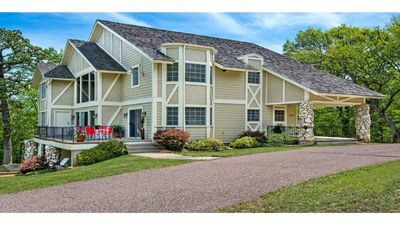 2640 square feet 3 stories of Views and nature Right on the Water of a 5 acre pond with amazing Views of the Marina. Comfortably appointed living room that will seat 15 comfortably. All New Kitchen with New granite counter tops and stainless appliances. Enjoy your meals on a turn of the Century Large Oak claw foot Dinner Table. 2nd floor is the Huge 17' x 24' master bedroom with a massive pillow top king size bed and sitting room with a full picture window 17' wall of windows exposing incredible views of the water and Marina. Within a mile of the marina and a short drive to Restaurants, boat launch and parking. Have fun fishing in the semi private pond with a 12'x16' fishing and canoe dock. 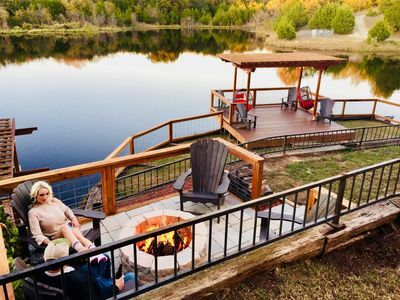 This deck/dock is fabulous for relaxing by the water edge, getting the canoe ( life jackets and adult supervision is required) A little piece of heaven in the back Yard!. Fun for a weekend getaway or a full family vacation. The living room has its own Massive deck for an awesome evening sunset. Full kitchen with all cooking utensils, dining table to seat 8 as well as two high bar stools at kitchen counter top. WE HAVE AN AMAZING GREAT ROOM CENTRAL AC and HEAT, 5 FLAT SCREEN TVs, 4 BEDROOMS SLEEPS 16 ADULTS, 3 FULL BATHROOMS, 2 TUBS and SHOWERS, FULL KITCHEN DINING ROOM, On the Water for YOUR VACATION of a LifeTime. Air Conditioning Central A/C separate units on each floor Bedroom 1) Sleeps 8 = 2 Boat shaped Cruiser beds with trundles that also sleep 6 plus a pull out sofa sleeper that sleeps 1 adult or 2 children Bedroom 2) Sleeps 4 = 2 in a Pillow Top King 2- in a comfort memory foam sleeper sofa. Bedroom 3 Sleeps 2 = New Pillow Top Queen bed Bedroom 4 Sleeps 2 = New Pillow Top King bed 1st floor Deck 12' x 24' straight to the Water 2nd floor Deck 8' x 8' Marina Texoma and pond View 3rd floor Deck 12' x 24' Marina Texoma and pond View 4th waters edge 12'x16' Deck / Dock perfect for fishing canoeing swimming and relaxing Dishwasher Yes Grill/BBQ Yes - bring your propane bottle Laundry Washer & Dryer - bring your soap Outdoor Misc. Large round cast iron Table with 8 swivel rocking Chairs Fire pit with 4 chairs - bring your wood Parking Spaces 4 3 Stories DISH TV View Full Water View out of all North facing windows SORRY NO PETS ALLOWED FAMILY REUNIONS - WE HAVE 3 HOMES RIGHT BESIDE EACH OTHER IN THIS SECRET HIDEAWAY Texoma Time Lake Houses 127, 129 & 131 Greenway bend Pottsborro Texas. each house Sleeps 15 in beds. We have 3 Lake houses beside each other for rent. VRBO #784323 VRBO #1040215 VRBO #1187193 each home sleeps 15 and has over 2650 sf 127 Greenway Bend VRBO #784323 Weekend Rate $1050 Friday 4 pm - Sunday 11 am features a Marina theme in the bunk Room with that theme carrying that Nautical theme throughout the home. It is the Dark Blue House. 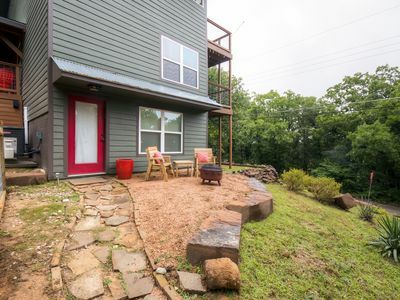 129 Greenway Bend VRBO #1040215 Weekend Rate $1050 Friday 4 pm - Sunday 11 am Features a treehouse theme in the bunk room carrying a Tree theme throughout the rest of the home. It is the Light Gray House. 131 greenway Bend Weekend Rate $1050 Friday 4 pm - Sunday 11 am Features a Canoe and Paddles Nautical theme through out the rest of the home with a turn of the 20th century Canoe hung on the wall. It is the Dark Gray House. LAKE TEXOMA. Water-Pond front / Marina view / Golf / Fishing "TEXOMA TIME" vacation rental in the resort. Vacation rental Town Homes. Sleeps 15 Adults, 4 bedroom, 3- 4 bathrooms. These houses are theme decorated. Water front location with access and beautiful view 24/7. All water sports and fishing just steps from any door of this lake home. Dining on the deck is always a treat. This quiet neighborhood is only 1 hour 15 minutes from Dallas. Master bedroom downstairs with large bathroom including double vanities. Surrounded by nature and the beautiful lake - all will enjoy this setting. Inside comfort, games, flat screen DirectTV, fully equipped kitchen. Two bedrooms upstairs. One upstairs bedroom has a very comfortable queen bed; the other upstairs room has two full size beds and plenty of room. All rooms have ceiling fans. Pottsboro, TX. Preston Point Minutes from Highport Marina, Lighthouse Marina and Little Mineral Marina Beachfront- Waterfront Compound are two homes located directly next door to each other. The two homes can accommodate up to 20 people. Houses sleep a total of 16 in beds with the addition of your 4 air mattresses. Each home is true beachfront with easy beach access. The front of the both homes are walls of glass with amazing water views. Water views from den, dining room, kitchen, master bed and screened porch. Each home was designed by a professional 'lake bum' for the best of lake living. Beachfront-Waterfront Compond is the total package for an easy, relaxed vacation. Located in an upscale neighborhood, Beachfront-Waterfront Compond provides a safe, secure get-a-way. Living Room: both homes have amazing water views, 50' flat screen tv, Harman Kardon Bluetooth stereos. Dining Room: both homes have teak table sits 8 guests. Great water view. Kitchen: well-equipped and everything you need! Calphalon cookware and Henckel cutlery. Besides the expected amenities, we also provide a coffee maker, crock pot, and many other kitchen appliances. You will also find a large assortment of spices and other necessities for cooking. Quartz counters. Enjoy the water view from the kitchen as you cook! Screened Porch: each home is set up for entertaining. Tv's on patios, large gas grills and 2 dining tables per home. Great water view. Master Suite: both homes have amazing water views. Casa Lotta Moolah has a Tempurpedic brand queen size bed. Casa Deuces has new king size bed. Both suites have flatscreen TVs, and Master Baths with Quartz counters and slate tiled walk-in showers. Guest Bed: Guest bedrooms have queen size beds. Bunk Room: Both bunk rooms have 4 pillow top mattresses. Bunk beds are built in for safety. Each home has a Firepit on water front lawn. Plenty of room for horse shoes and yard darts. Texoma is a State Park and Corps of Engineers do not allow private boat docks. Boats can be beached or anchor dropped in front of the home. I recommend dropping anchor. Another GREAT OPTION is to rent a secured boat slip at one of the marinas I've listed below. The nearest Marina is 1.7 miles. I have plenty of room for boat and trailer parking. Little Mineral Marina: 1.7 miles Boat launch, slip rental, boat rentals Restaurant Lighthouse Marina: 3.1 miles Boat launch, slip rental, boat rentals Highport Marina: 7 miles Boat launch, boat rentals Restaurant Tanglewood Golf Course: 7.6 miles Choctaw Casino: 30.2 miles *** Maxium of 20 people on the property, day or night, unless approved by owner. *** Owner must be notified the number of Guest between the ages of 16-30. ***No High School Parties ***No Prom Parties ***No HS Graduation Parties *** Owner must be notified of pets prior to arrival. *** No cooking with curry, turmeric, or cumin *** Violations will result in immediate vacating or property and forfeiture of all fees For an awesome aerial view, scroll down to map. Click 'Satellite'. 'Zoom In'. 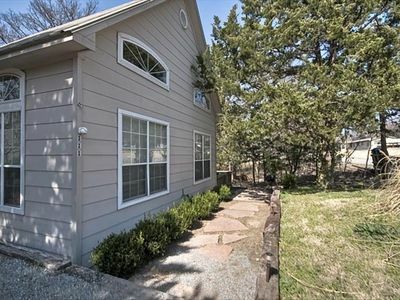 Keywords: Beachfront, Waterfront- True beachfront with Lake Texoma in the front yard. Sleeps 20. Please click on each link below for comprehensive details of each house: https://www.vrbo.com/382652 https://www.vrbo.com/449524 Over 180 ?????????? 5-Star Reviews on properties on individual links. ?????? Beach your boat or drop anchor off shore for all day boating. The houses sleep 16 in beds and an additional four Guest on your air mattresses. Maximum of 20 people on the property, day or night, unless approved by owner. 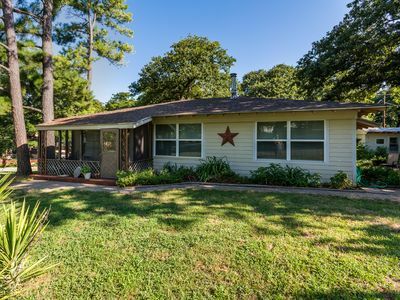 You’ll love my place because SAYKM Lake House is unique to Lake Texoma and boast beautiful scenery along with sandy beaches just walking 2 minutes down the street. We are one hour from Dallas, Texas and makes us a great weekend getaway! Relax in private hot tub or sit out and enjoy a bonfire! Fresh eggs for your stay from our chicken coop and a welcoming basket upon arrival. We have two flatscreen with dvd players, fully stocked kitchen and linens. Whatever your pleasure you will find it here! The house is 1,200 soft with two bedrooms with one bath and a huge screened in porch! High-end linens, towels and all the amenities of a hotel in your own private residence on Lake Texoma. Fully remodeled and gives you the lake feel as soon as you park. We have sandy beaches, lots of trails to hike and a boat dock at the end of the street. Tons of things to do like kayak, boating, fishing, sunset cruises and all the things you can ever want with the big body of water 1 minute from our house. 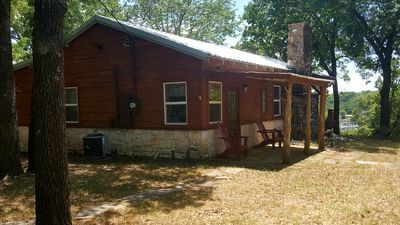 Awesome secluded cabin with great lakeview close to community boat launch! How about a canoe suspended from the vaulted ceiling in the living area? We've got it! 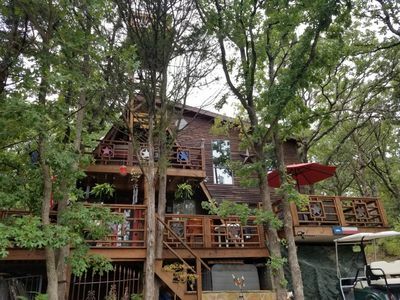 You will love our driftwood patterned flooring, indoor fireplace, huge windows with expansive view of the trees and lake view, covered deck, open air deck with propane grill, and sleeping accommodations for 6. Enjoy an easy walk all downhill to the lake and community boat launch and fishing dock. Looking for some great food and entertainment? Jump in your car (or boat) for about a 5 minute drive to Tanglewood for live music, delicious food, and tons of yachts! Feed the ducks and fish from their outside deck - the kids and adults will love it! Call one of the great fishing guides for a fun day on the lake. This cabin boasts two spacious bedrooms, one with KING bed with pillowtop mattress. Second bedroom features two pillow top twin beds. If you bring along some friends, feel free to pop open the queen sized sleeper sofa. All the amenities you would expect are supplied in the kitchen. We provide coffee, spices, and enough utensils for the pickiest of chefs. Outdoors, we have covered parking for two vehicles and a spot for your trailer or boat. This area has one outdoor security camera for your protection. Have fun roasting wieners or making s'mores (we provide the s'more "fixins") on our fire pit with reclaimed tree stumps for seats. Hike in the woods, jog the hills, or enjoy our satellite TV and free WIFI. The decor is so much fun.. check out 'Buck' the pirate deer (faux) mount, all our cute signs, and as the sign under the clock says: 'It's 5 0'clock somewhere'! 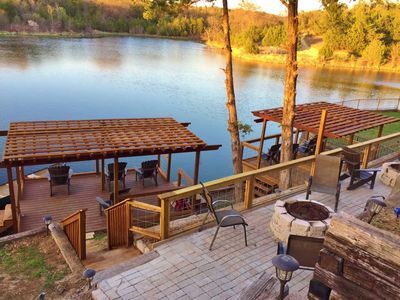 Throw your steaks and burgers on the propane grill while you enjoy watching the boats on the lake from the covered and uncovered deck which features comfy bistro table and chairs! Choctaw Casino is about a 30 minute drive from the cabin. Check out THE DISTRICT with state of the art bowling alley, , 4 movie screens, laser tag, and tons of good food and games for the entire family! Take a relaxing hike down to the lake and watch the ducks, geese, etc. or throw in your fishing pole and try your luck at catching dinner! Why drive to Broken Bow with the kids asking "Are we there yet?" 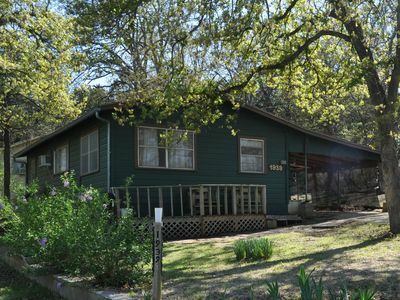 Driftwood Cottage is only a short drive from the metroplex and Lake Texoma can't be beat! Be sure to take a drive to Hagerman National Wildlife Refuge about 10 miles away. Hiking, tons of wildlife, guided tram are some of the fun you can have at Hagerman. Extreme Sandbox as seen on Shark Tank is literally "around the corner" near the entrance to Tanglewood! This is the 2nd location... check it out during your stay at Driftwood Cottage! Enjoy shopping and dining galore in downtown Denison..a short 10 miles away. Visit the birthplace of President Eisenhower located in downtown Denison. If you are a quilter or antiquer, you will love the quilting shop in Pottsboro and the great antique shops on Main Street in Denison . Denison is renowned for their beautiful churches and festivals. Doc Holiday was a frequent visitor to Denison and now has an annual festival of his own on Main Street each year in April. 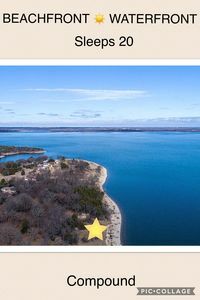 Lake Texoma is one of the only lakes with large islands which boast beautiful sandy beaches, clear water, and lots of dining options in the marinas. You might even catch a glimpse of Blake Shelton at his lakeside home across the lake in Oklahoma! The fishing is great and many guides will show you their secret fishing spots! Come see why we call Lake Texoma "home"!